This section features exclusive paintball gun reviews based on my independent research and in-depth analysis. I have sampled 20 paintball guns from several manufacturers in this review; including D3FY, Tippmann, Spyder, Planet Eclipse, Azodin, and DYE. For each marker, I have provided all the vital details, including key features, performance rating, ease of use, maintenance tips, unique features, as well as their pros and cons. I have also given my unbiased opinion and final verdict on each paintball gun listed in this section. If you are only interested in the highest-rated paintball markers, you can check out my exclusive list of the top 10 paintball gun models in the market. 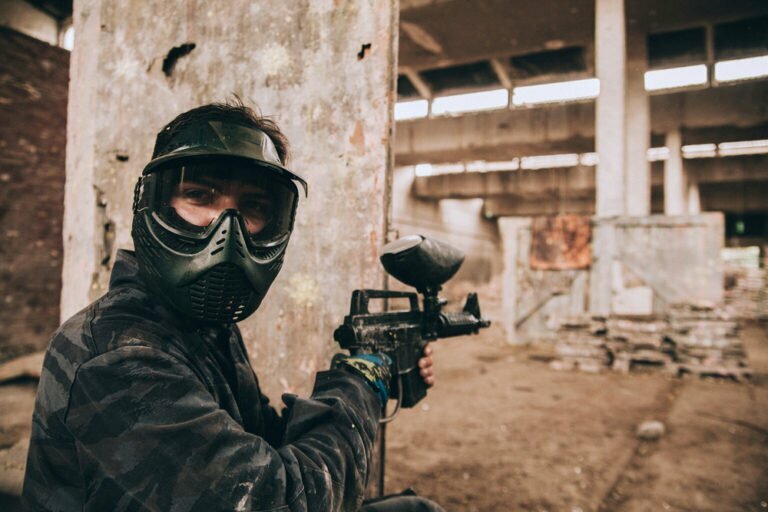 You can also search for paintball markers by manufacturer in our paintball gun brand page, and if you are on a budget, I have made your search easier by including a page that lists products by price range. The famous Empire Mini GS delivers prime-quality and you can count on top-rated performance on the field. Although it is based on the previous version, this unit offers a lot more versatility and accuracy. The grip has been significantly improved in order to provide top-notch comfort and you will discover numerous of fantastic improvements, along with sophisticated new features in this marker that were designed to make the most of the latest technology from Empire. Overall, here we have a paintball gun that is chock-full of excellent qualities which include On/Off ASA combined with easy-to-use design and functions. This marker from the Tippmann stable has been receiving fantastic reviews from happy customers that are extremely happy with its performance. With this marker, you’ll benefit from the most up-to-date major development that Tippmann has to offer. Moreover, this marker includes all the finest qualities that you can get from a first-class paintball marker. Additionally, Tippmann has done a great job in improving accuracy and performance to boost the overall playing experience on the field. Apart from fantastic performance and accuracy, current owners are thrilled with its consistency and durability. Furthermore, Tippmann improved versatility and allows you to customize the unit to suit your needs and demands. 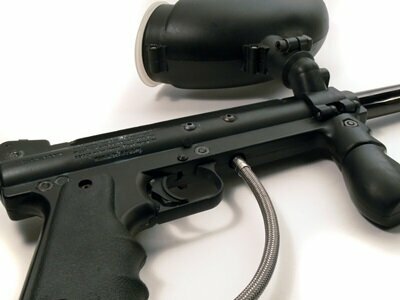 The DAM Assault from Dye is the number one marker for Mil-Sim game.This paintball gun is ideal for players who are on the market for a paintball gun to play in tactical or scenario play. It has everything you need to play paintball as it provides quality performances and precise accuracy during gameplay. Therefore, you can be sure that you are playing with a quality constructed marker that suits any skill level. The Dye Proto fits both mid-level players and also those who are making their first step in the paintball world. This unit features fantastic design and great performance. The main reason why this unit is perfect for beginners is its durability and reliability. There is almost no learning curve with this marker because it comes out-of-the-box ready for play and there are no settings to deal with. Additionally, it is very lightweight and features a comfortable grip that enhances the accuracy. If you end up with the Proto Rail you can be sure that you are investing in a marker from a reputable manufacturer that delivers budget-friendly markers without sacrificing quality. When it’s about performance, the Sniper Pump from Empire is simply brilliant and snaps paintballs out of the barrel extremely quickly. The reason for its fast firing rate is because it includes an electric loader. This unit is your number one pick if you are looking for a high-quality tournament marker and this unit was built to last. With that said, you can expect superior efficiency while you are playing if you end up with the Sniper Pump from Empire. It is developed on the basis of the well-known Autococker sniper. Now is your chance to invest in a top-notch tournament-level marker at a prize that is very hard to beat. The Geo3.5 is a brilliant, premium quality paintball marker that offers sophisticated qualities that will optimize both your performance and efficiency on the paintball field. Current owners are extremely happy with its dependable overall performance and the advanced bolt speed control system, integrated filter for the body and the innovative spool valve concept. Additionally, users that own the Geo3.5 mention that it fires smoothly and shots are extremely consistent as well. Moreover, the Geo3.5 features a stylish and compact design that feels great to handle. Apart from that, it is beautifully streamlined and lightweight to run around with. Next up is one of the budget-friendliest paintball guns for sale today. However, keep in mind that the manufacturer did not sacrifice quality for price because it features a comfortable grip and premium performance. This marker was designed to replicate a real military weapon and you will be pleasantly surprised to find out that it also performs and operate like a real military gun. Inside the package, you will receive rails that are intended for customization and a magazine that you can utilize as a storing space as well. One of its key features is the mechanical trigger that allows you to shoot with extreme accuracy and this mechanical trigger makes shooting a breeze. This unit comes with the brilliant FlexValve technology that was developed to deliver superior air efficiency because its mechanism operates below 300 PSI. With such an efficient performance, you can expect the marker to instantly shoot 1400 shots from a tank of 4500PSI. Additionally, with this electronic marker allows you to easily switch between air pressure or CO2 pressure. Moreover, you can even choose between electric or manual firing modes. Overall, here is the perfect marker for Mil-Sim or Woods ball gameplay. If you are looking for a high-quality unit to use in demanding game plays, you should seriously consider the X7 Phenom. The Axe Marker is a high standard paintball gun that is very reasonably priced if you take into account every one of the outstanding elements of this paintball marker. This unit features an elegant style and offers a comfortable grip that will help towards improved accuracy. It is extremely easy to assemble it and if you want to remove any of the components of the marker, you just have to press a button. This is very beneficial when comes to proper maintenance because with just a push of a button, you can easily access the parts that you need to clean after use. The TiPX from Tippmann not only looks like a military gun but also feels like it. It comes equipped with a CO2 air system and rail system for further customization. This unit is magazine fed and semi-automatic, therefore, it feels like a real pistol to operate. This is the only paintball pistol available on the market today that features a real-pistol design. Tippmann has developed a top-rated paintball pistol that is affordable and packed with awesome features. It has been receiving fantastic reviews from tactical users that are thrilled with its performance and efficiency. Moreover, it is very easy to clean and can easily be taken apart for proper maintenance. The Tippmann Cronus is a high-quality paintball marker that fits well in hands of both beginners and experienced paintball players. This unit features dual feed options where you can choose between magazine feed option or traditional loader. Moreover, it has in-line bolt system that ensures top performance. It also includes a comfortable grip and an easy-to-pull trigger that helps you to maximize your accuracy. Additionally, this marker is built from high-quality materials and was built to last. One of its key selling points, apart from its durable construction, is its price tag. There are not many paintball guns that offer so many upgradeable features as this Tippmann Cronus. In other words, you can count on exceptional performance while you’re playing with this unit. 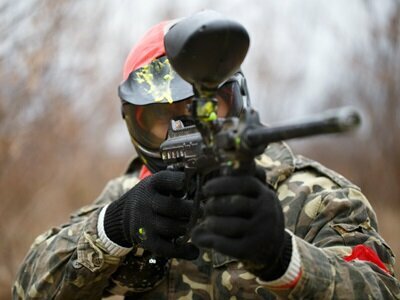 The Tippmann TMC MAGFED Paintball Marker suits both beginners and experienced paintball players. It highlights awesome design and delivers high-end performance with its shooting ability. If you are just starting out, you will be blown away by its overall efficiency. 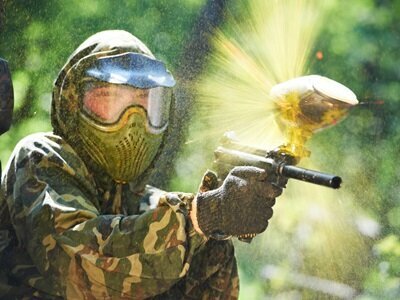 Moreover, for seasoned paintball players, you can count on reliability, durability and consistency. The best thing about this marker is its simplicity and there are no complicated features that you need to understand. All in all, this marker will significantly improve your accuracy if you practice enough. There is no skill involved to master this paintball gun, just head out on the field and practice as much as you can. If you decide to opt-for the Spyder MR-100, you will play well but only if you practice. However, there are few things that you need to consider before you buy the MR-100. With the Spyder Mr-100, the quality of the loader or hopper is extraordinary. Additionally, with its capacity you will be able to hold a good number of paintballs inside, which is extremely helpful, even if you miss your shots. At last, durability is something you can count on with the Spyder MR-100 and it is built for rough play extreme gaming conditions. It is crazy how quickly a fun game of paintball can turn competitive. You find yourself thinking about duck and roll maneuvers in the middle of a hectic day at work. On the drive home, you practice checking your rearview mirror to see if you’re being followed. Preparation is half the battle won, they say. How can you possibly consider yourself prepared without having the best equipment on hand ready to use? You need something small, light and accurate. What if we add to the bargain? With that said, you can have the best possible marker at an affordable price by purchasing the fantastic Umarex XBG. Paintball is a game which requires you to be accurate and precise. Therefore, it is important for you to choose the most important equipment of the game wisely. A paintball marker should give you an outclass performance to hit the target. While choosing the best option for yourself, bear in mind the optimal functionality of the marker to enjoy the game to the fullest. 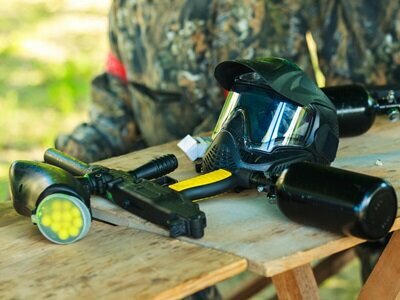 If you are a beginner at play paintball, choosing the right marker could be a daunting task for you. There are too many options out there that might confuse you. They are available in different qualities and prices. However, this Dye Proto may be your perfect match for your next paintball tournament. The Tippmann A5 paintball sniper gun is a new design that leaves behind the old and the competitors in the market. This gun has everything that you will need as a sniper on the paintballing field and more. There are enhanced basic performance features to make it one of its kinds. The additional features act as add-ons to the gun making it better than any other in the market. If you find it difficult as a sniper to find the right gun for you, then check out the Tippmann A5 detailed review to find the perfect match for your playing style. Here is the perfect paintball gun for both seasoned players and beginners. This unit is packed with fantastic features and is also extremely budget-friendly. This marker is extremely durable which ensures that you can use it for many years to come. Although this marker is durable, it is also extremely light and easy to carry. Moreover, it has received excellent reviews for its accuracy and range. On top of all the great features that come with the Tippmann Gryphon, there are also many upgradeable options available once you have mastered the great game of paintball. All in all, this is a high-quality and sturdy equipment that suits any paintball player, regardless of experience. Probably the greatest qualities of the Tippmann A5 is its upgradeable and customizable options that allows you to take your game to a complete new level by making the most of numerous add-ons available on the market. First of all, this unit is an advanced version of the good old Tippmann 98 custom and is an ideal fit for those who have an experience in the paintball world. The A5 delivers top-notch performance feed system that makes use of air in order to operate the loader which guarantees hours of heavy use. Since this unit does not rely on batteries, the air feed system ensures extremely fast shooting performance, up to 15 balls per second. If you are looking for a high-quality paintball marker, you should check out the Tippmann A5. Thanks to the simple design of the GOG eNMEy, it makes the perfect fit for newbies. Additionally, the lightweight and compact design ensures hours of use without you getting tired. One of its greatest feature is that it comes out-of-the-box fully pneumatic. Therefore, every time you pull the trigger, you will experience fast and smooth shooting that will significantly help you to improve your accuracy. 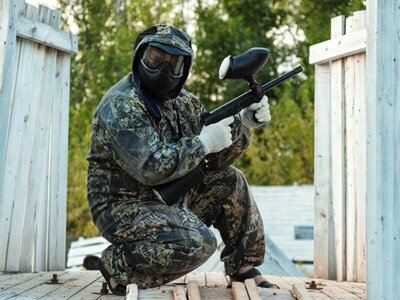 Faster and smoother shooting also ensures quiet operation and less recoil than with other paintball markers. If you decide to invest in this marker, you will be able to easily upgrade the GOG eNMEy to more advanced level with more sophisticated accessories. Once you take into account all the great features of this marker, it is safe to conclude that this paintball gun is an ideal pick for those who are looking for an entry-level marker, with the option to upgrade later. Based on the hugely popular Etha marker, the Planet Eclipse Etha 2 is packed with fantastic bells-and-whistles that combines the latest engineering and innovation into a stylish paintball marker. This unit was built to withstand the toughest game scenarios and it is guaranteed to last for many years to come. It is extremely easy to operate the gun and it is a perfect fit for different playing styles. Moreover, it features a compact design the provides easy and quick shooting experience. Thanks to the dual feeder system, you can enjoy many hours of use without having to worry about losing power. This marker is one of the top units for sale today and users are extremely happy with its high-quality features and top-notch performance. 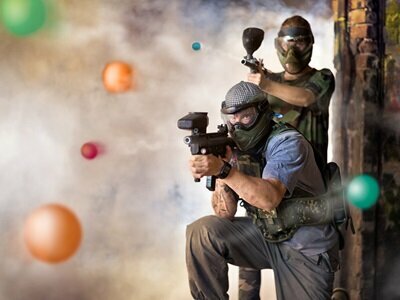 Paintball is a terrific outdoor team activity, and playing with the best marker not only enhances your performance but it boosts your confidence as well. I have tried out and deeply analyzed each of the products featured here above, hoping that the information I have provided in this review will be of help to both entry-level and seasoned paintball enthusiasts. Each of the 20 markers has its own pros and cons, and I have outlined them under each item. The products also perform differently when on the field. Therefore, you should be aware of the results you wish to achieve when selecting your ideal paintball gun. For example, some paintball markers like the Empire Axe will deliver more accuracy than others will, while some like the Tippmann 98 Custom are best in delivering accurate long distance shots. I’d also like to invite you to visit our accessories page to find some cool vests and masks to wear when paintballing with your new marker.